Luke Chapter 1 tells the story of an old man named Zecharias. He was married to an old woman named Elizabeth who was a relative of the Virgin Mary. They lived in the hill country of Judah, exact location unknown. Both were of the priestly line. They had no children – Elizabeth was barren, and in their culture barrenness was considered a punishment for sin. Yet both were righteous in God’s eyes, and to the best of their ability they continued to worship Him, keeping the law. Zecharias (and no doubt Elizabeth) had long prayed for a son. But, he was old and she was barren, so it was now impossible. So, was he still praying? He was still faithful to do his job, in any case. It was his turn to minister before the golden altar of incense in the Holy Place, possibly for the first time in his priestly service. With so many priests serving in the Temple, entering the Holy Place and kindling the incense upon the golden altar was possibly a once-in-a-lifetime experience. Suddenly an angel of the Lord appeared to Zacharias, standing to the right of the altar of incense. The angel gave him an extraordinary message, on this extraordinary day. His prayers had been answered; he and Elizabeth would have a child. And not just an ordinary child, an extraordinary son. He was to give him the name John. Read the chapter for yourself. He was old. So was his wife. He was childless, thought by the culture to be a punishment for sin. He was considered by God to be righteous, however. Blameless. He had prayed for a son, starting in the days when having a child was still possible, biologically speaking. He was faithful to his job, his calling, despite that disappointment. He was granted favor, mercy, compassion; an answer to his prayer. His prayer wasn’t answered in an ordinary way, in an ordinary location – an angel came to his job site, while he was doing his job; being faithful to do his job. He was human; he doubted the angel’s message. Considering his age and the length of time he had been praying, that was a quite understandable response. He was corrected but not condemned for his doubt. He wasn’t removed from his ordinary job, or replaced in his extraordinary new job: being a parent. A very old parent! He was granted a device to help him assuage his doubt: silence until the baby was born. How long have we prayed the same prayer, over, and over, and over? How often have we decided to give up, quit doing this job, quit worshiping, quit praying, quit believing? Until it will take a supernatural, extraordinary miracle for it to happen? But those do still happen. Zecharias and Elizabeth were just two of many people who received miraculous answers to prayer. Never quit being faithful to your current assignment. Never quit praying. Never quit believing. Bowed over for 18 years, imagine that. Dirt. Feet. Floor. Street. Sandals. Trash. Maybe a few children’s legs, a few knees, a few steps, a few chairs. But she could mostly see the stuff nobody really wants to see. Dirt. The blue sky, fluffy clouds, people’s smiles, the beauty of the trees, the glory of the Temple, the rolling hillsides, the things people do want to see, those she couldn’t really see. And yet on the sabbath day there she was, in the synagogue. The men and women were separated in the synagogue, the men on one side, the women on the other side. There was supposedly a good reason for that, but whatever the reason, there was the bowed-over woman, in the right place at the right time. I have a few questions about why she came that day. Was this her usual sabbath ritual? Go to synagogue, pray the prayers, hear the sermon? Hope for a blessing? Or was it because she knew Jesus would be there, and maybe, just maybe, he would do something special for her? By the time this occasion happened, Jesus had done many miracles, some in synagogues. He had attracted great crowds, many followers. He had chosen some to be apostles, and they had gone out doing miracles too. Word always got around pretty fast when Jesus was in the vicinity. I can imagine the news being spread, can’t you? “Hey, did you hear? Jesus is coming this way!” I can visualize the townspeople telling their families, their neighbors. I can see the news arriving at the home of this bowed-over woman. I can almost hear her thoughts – I’ve got to get there, I’ve got to get where he is, I’ve got to get near him. When it was known that Jesus was nearby on the sabbath, everyone knew where he’d go – to the synagogue. It was his custom. If the bowed-over woman always attended that synagogue on the sabbath, she was well known to the leaders. The teachers in charge, the men and women of the area knew her condition. Their hearts should have been full of sympathy and compassion towards her, helping her to get inside and find a good seat, hoping right along with her for a touch from God today. That was not their attitude, however. By then, the Jewish leaders had gotten leery of Jesus. He had become a rabble-rouser, a trouble-maker, preaching about a Kingdom. Claiming to be God! Dangerous nonsense. He was stirring up too much attention from the Sanhedrin and maybe even the Romans. Miracles? It was as if the miracles had become invisible, not real, while the potential for a Roman crackdown was very real. I doubt if the sick, the crippled, the blind, deaf and dumb, demon-possessed worried too much about what the Sanhedrin or the Romans thought. They just knew they had needed help and nobody else had helped them but Jesus. No longer sick! No longer blind! Healed, healthy, whole, they were free. Many also became followers. He was teaching in one of the meeting places on the Sabbath. 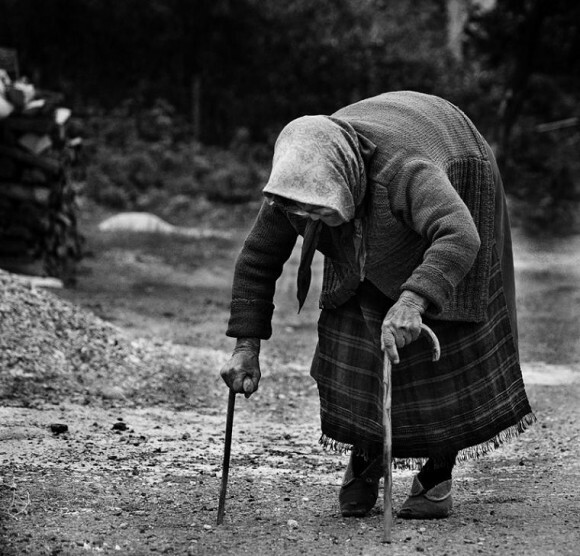 There was a woman present, so twisted and bent over with arthritis that she couldn’t even look up. She had been afflicted with this for eighteen years. When Jesus saw her, he called her over. “Woman, you’re free!” He laid hands on her and suddenly she was standing straight and tall, giving glory to God. Several things come to mind. The woman was a daughter of Abraham. She was faithful to attend services. She wasn’t just sick, she was bound by Satan. She was not healed by all the sermons and prayers she’d heard in synagogue all those 18 long years. She didn’t need another sermon, she needed deliverance. She believed Jesus could provide what she needed. And so, when Jesus called her out, she obeyed him. Even though it might have been physically hard or socially embarrassing, even though the Jewish leaders were trying to discredit him, she came forward publicly. She got the miracle she needed. With a touch from the Lord she was straight and tall, delivered and healed. She gave God the glory. “Joshua fit the battle of Jericho…” Remember that song? I learned it in Sunday School many years ago. This article isn’t about Joshua, though, it’s about someone who lived and worked in Jericho at the time of Christ, perhaps the richest man in town. Chief tax collector, Zacchaeus. As I investigated Zacchaeus and Jericho a bit further, I had several questions. Here are some of the answers I found. What was his job? Chief tax collector; he probably supervised several other tax collectors and all of them worked for Rome. Their own income came from overcharging the people – they pocketed the difference. He may have been acquainted with Jesus’ disciple Matthew (Levi), who had the same job. What was his position then in the community? Wealth, influence with Rome, reputation as an astute businessman, since he’d been elevated to “chief” tax collector, employees and servants, influence and/or friendship with other Jews who had a vested interest in seeing that Rome stayed happy. We aren’t told if he had a wife and children. He was despised by the ordinary citizens since he cooperated with their enemy and took advantage of his own people. Ethics / morals? On a par with his job, no doubt. He knew the Jewish law but going by his own words he didn’t really keep it. He really couldn’t keep the law and his job, and we know which one he kept. Traditional Tree of Zacchaeus in Jericho, said to be approximately 2000 years old. Spiritual condition? Hungry for something more. Zacchaeus was aware that Jesus was in town. Perhaps he’d heard gossip from underlings or house servants, but somehow he’d heard about Jesus. His curiosity wasn’t the only thing that took him into the street. No businessman would climb a tree in public! What would people think? Of course, he didn’t really care what the ordinary people thought. He had everything any man could want and wasn’t happy with it. He wanted to see this Jesus person. Being short, Zacchaeus couldn’t see over the people in front of him, but the crowd didn’t respect him enough to give him space. They wouldn’t let him get close enough to the street. I think Zacchaeus was desperate to see Jesus. What were people saying about Jesus? He raised the dead! He healed the sick! He turned water into wine! Who wouldn’t want to see a man like that? But I don’t think many would climb a tree to do it, unless they were desperate. What did it cost Zacchaeus? Everything he had. After his meeting with Jesus, he couldn’t be a tax collector any longer. And he himself promised to do more than the current religious leaders required, he promised restitution more in line with the actual law, even better than the actual law. He had to have counted the cost. If he meant it, he would have been giving back a great deal of money and cutting off his livelihood and his relationship with the Romans. But what he gained was worth it; eternal life, starting now. Where and what kind of place was Jericho? For this, I went to the internet and did a little research. I knew some of the Old Testament stories about things that happened there, and Jesus’ story of the Good Samaritan takes place near Jericho. It was a prominent city in the days of Joshua before the “walls came a-tumbling down,” put under a curse by God and deserted for all practical purposes. By the time of Jesus the city had been rebuilt and was prominent again. Herod even had a palace there, overlooking the city. Thieves and robbers had a wonderful time of plying their criminal trade along the steep and dangerous route down from Jerusalem. Fascinating story about Zacchaeus, and a fascinating town he lived in. “Jericho is located near the southern end of the Jordan Valley about eight hundred twenty-five feet below the level of the Mediterranean Sea and about two hundred feet above the surface of the Dead Sea. The area around it is watered by springs and small streams, and since 7000 B.C. Jericho has been an oasis and a population center in the otherwise mostly barren valley. Some scholars think Jericho is the oldest continuously inhabited city in the world, and it was called the city of palm trees in Judges 1.16. Intersecting there since historic times have been a major road that comes down the Jordan Valley, one that crosses the Jordan River (five miles east of Jericho), and one that leads up through the steep, barren hills to Jerusalem, which is fifteen miles to the southwest and more than two thousand feet higher than Jericho. 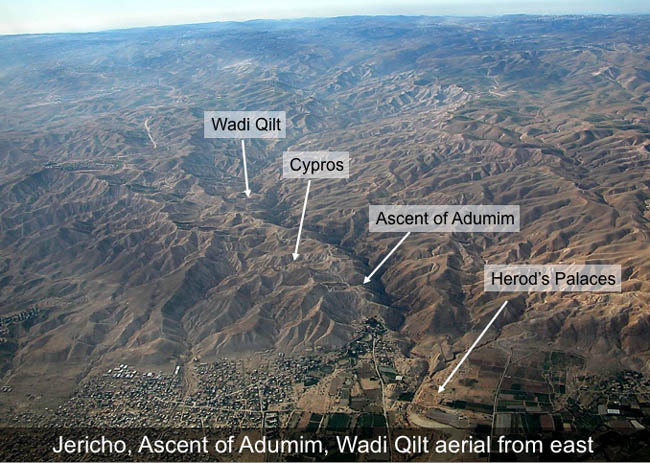 Jericho had high walls and protective towers in ancient times, as it did when Joshua led the people of Israel across the Jordan River on their way to occupy what became their land. But the city was built of sun-dried mud bricks, so it was often invaded and captured by enemies. These ancient bricks have mostly washed away, and so archaeologists are not sure which part of the city was standing when Joshua captured it (Josh 6). Elijah went through Jericho and met fifty prophets, who followed him to the Jordan River just before he was taken up to heaven (2 Kgs 4.4–12). Elisha began his work as a prophet in Jericho (2 Kgs 4.13–22). When Jerusalem was destroyed by the Babylonians in 586/587 B.C., King Zedekiah tried to run away, but the Babylonians caught him and put out his eyes on the plains near Jericho (Jer 52.1–11). After the Jews were allowed by the Persians to come back from Babylonia to their land, a number of those whose families were originally from Jericho returned (Ezra 2.34), and some of the workers who rebuilt the walls of Jerusalem came from Jericho (Neh 3.2). 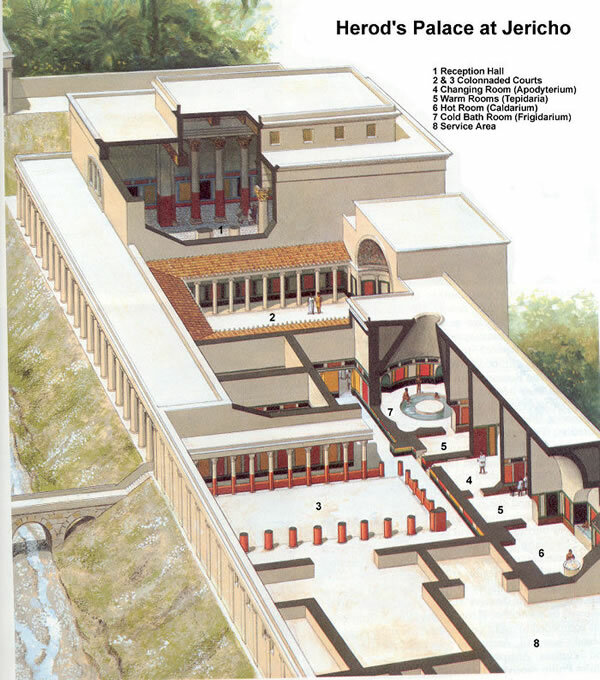 The Romans made Herod king of the Jews in 37 B.C., and he then built a winter palace for himself and a Roman-style city just northwest of ancient Jericho. Water was brought in from the Jordan River by an irrigation system. Herod’s new Jericho included a city center, a theater, and a stadium, and the city was surrounded by groves of evergreen and palm trees with flower gardens, fountains, and pools. It was the winter residence for Herod, his staff, and a large group of servants and supporters.